"He is risen in me! He fills my head with song! Pork and beans, pork and beans!" No, not Weezer, but Andrew Borba aka the Pork and Beans Vampire from "Never Kill A Boy on a First Date" (Buffy, Season 1). Pork and beans are a wicked combination and unsurprisingly have been embraced by many cultures - there's the canned all-American version, the spicy Cajun version, Spain's Olla Podrida or Fabada, the Chinese stir-fry, the French Cassoulet, and the Portuguese Feijoda ... heck, even baked beans had a hunk of pork in the original recipe. To me, pork and beans means the Burmese dish I cooked which captured my hubby's heart when we were at uni. 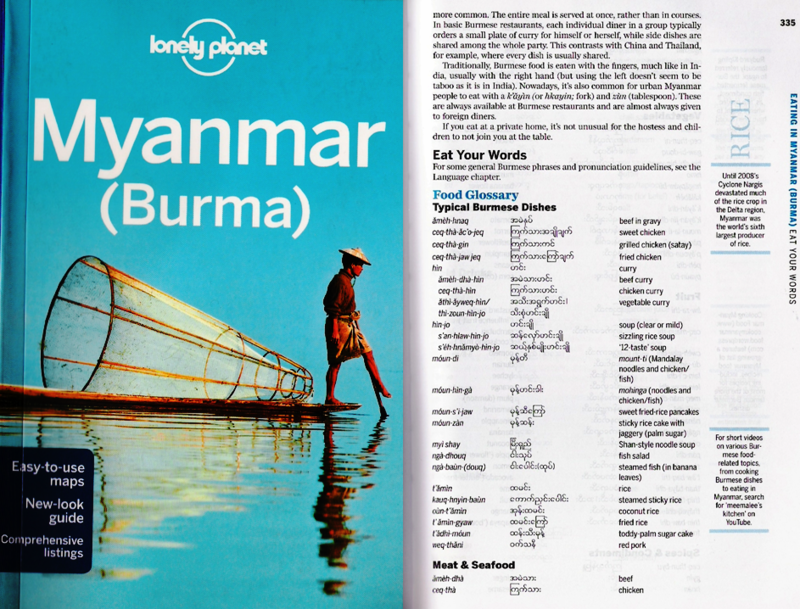 Known as hbè-thee wet-thar in Burmese (lit. "beans pork"), it's a typical meal from Mogok, land of the rubies, where pork particularly is best beloved. Hbè-thee wet-thar is a super simple dish - what makes it special is that you slice the beans on the diagonal. The beans I'm referring to are known as green beans, French beans, fine beans, string beans or even bobby beans depending on which neck of the woods you come from. 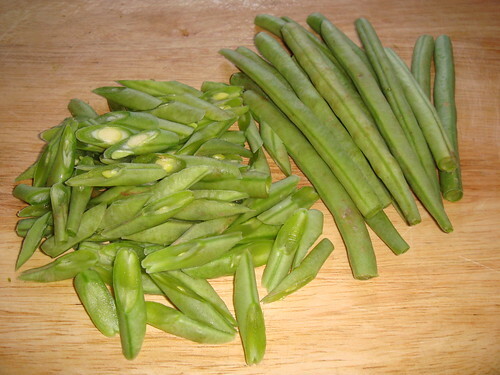 Slice the green beans on the diagonal so you get lots of thin, slanted sections. Heat the oil in a wok or big frying pan and add the pork. Break the pork up into little chunks with a spatula or chopsticks and fry until cooked but not brown. 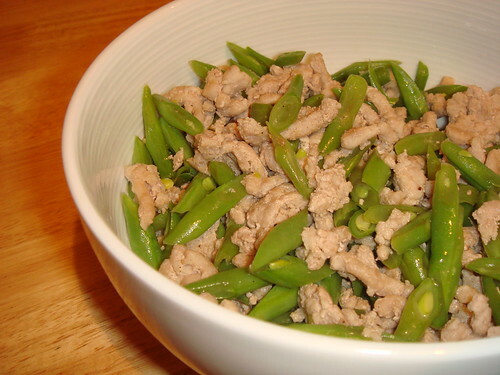 Add the sugar, salt and water (and MSG if using) and then add the green beans. Toss and fry just until the beans are cooked through (and stay bright green), and serve immediately whilst still nice and moist on warm, fluffy white rice. I know it seems like a bit of an effort, but slicing the beans diagonally is really worth it and makes a HUGE difference to both flavour and mouthfeel. If you leave the beans long and whole, or even slice them into normal, horizontal, short sections, it's difficult to get the texture right - they either stay hard and chewy or go limp and flabby. 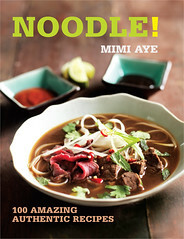 As for the MSG, that's purely for nostalgic reasons - Burmese people just like it, especially Ajinomoto. And yes, I've heard all the arguments against it, but on the other hand it's never affected me, and it's in a lot of stuff I like. 'A teeeny pinch of...'- ever so sincere of you. Love that M!